Our Fitness Boot Camp classes are designed to increase athletic performance, boost your VO2 and decrease body fat. A challenging combination of cardio drills and advanced techniques of compound and isolated muscle work is proven to physiologically transform your body. Guaranteed to make you stronger, leaner, and fitter. Get ready to be sore and want to come back for more! 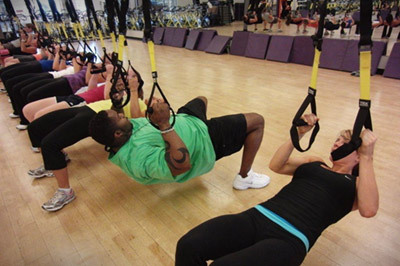 Our Fitness Boot Camp Littleton classes incorporate the TRX SYSTEM in their Boot Camp Fitness Class format. This revolutionary workout makes use of a simple strap with handles whose suspension design uses body weight and the laws of physics to create hundreds of exercise progressions with virtually unlimited levels of resistance. The TRX program includes highly functional exercises that will challenge your core, develop lean and powerful muscles, leaving you with increased energy and vitality. Our Sport Conditioning helps you train functionally for better coordination speed and agility! It incorporates alternate dynamic training with combined athletic drills from sprints to suicides. This camp is a fusion of boxing, martial arts, and aerobics! It offers an intense cross-training and total-body workout. This boot camp utilizes the training routines used by combat athletes in martial arts, boxing, and kickboxing. The objective of cardio kickboxing is not to make a “fighter” out of you but to give you a total-body training program. To sign up for a class, contact us at membership@clubusa.net!